Subsea gliders are taking to the oceans to hunt for an ever wider array of anthropomorphic and chemical signatures to an ever greater accuracy. Ocean glider systems are maturing. Since emerging in the 2000s, they’ve opened up new possibilities for ocean observation and monitoring. But, these possibilities are continuing to expand, including to gas seep surveys, leak detection, mammal monitoring and oil spill monitoring, for the offshore oil and gas industry. The primary attraction of ocean gliders is their ability to stay at sea for months, monitoring wide areas in remote locations down to significant depths. This is because they’re mode of propulsion is energy efficient. Rather than using a propeller to move through the water, gliders use changes in buoyancy which is converted into horizontal motion by fixed wings, creating a “saw-tooth” shaped trajectory through the water in depths down to 6,000m. To communicate the data they collect, they usually surface and use satellite or radio communication, which also allows them to receive missions and correct their positions. Using Teledyne Webb Research Slocum Gliders, Australia-based Blue Ocean Monitoring has been building its track record in the use of subsea gliders, including expanding the range of missions possible with these vehicles, to tasks such as drilling plume and produced water discharge monitoring and oil spill response activities offshore Australia. Ramsay Lind, General Manager – EMEA, at Blue Ocean Monitoring, says the company is the largest owner of Slocum Gliders, which weigh 50-60kg, operate for up to 120 days, payload dependent, and are light enough to be deployed over the side of a vessel. The Slocum G2 Glider can operate down to 1,000m and for 4,000-6,000km, with alkaline batteries (600-1,500km with alkaline), for up to six months (30 days with alkaline), traveling at up to 2kt. Positional accuracy can be supported using a Doppler velocity log (DVL) and magnetometers. 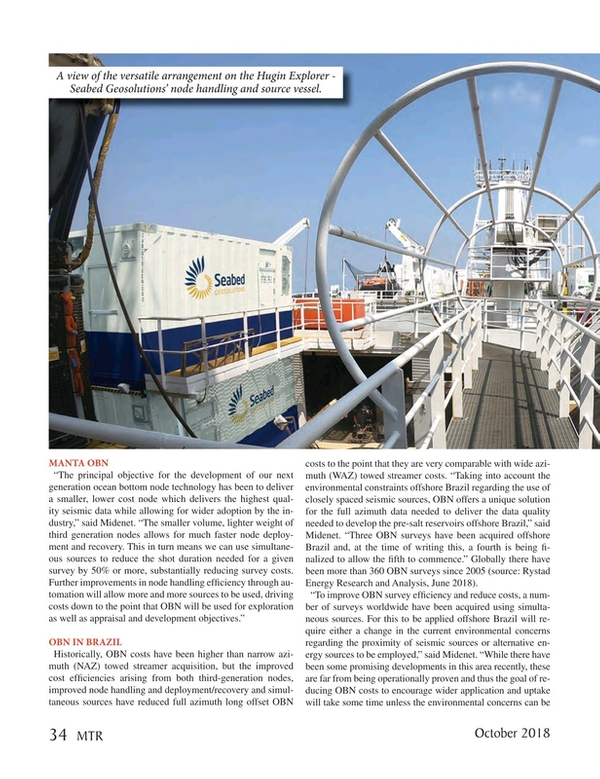 Working with Canada-based JASCO Applied Sciences, Blue Ocean has been doing passive acoustic monitoring (PAM) projects to aid environmental and anthropogenic monitoring during seismic surveys and, it hopes soon, also around offshore wind piling operations monitoring. For PAM operations, broad spectrum hydrophones are mounted to the gliders to record low and high frequency acoustics from marine life. Blue Ocean’s first PAM survey was in 2016, offshore Western Australia, during 3D seismic acquisition operations. The glider was deployed in the survey area and traversed four days, covering about 30km/day, depending on the current, before performing simultaneous operations with the seismic vessel. The glider, operating in about 200m water depth, had two payloads: a CTD (conductivity, temperature and pressure, i.e. depth) sensor and JASCO hydrophones, which picked up the sounds of the shots, as well as sounds from dolphins, at 10hz, and Omura Whales. Blue Ocean has also integrated fluorometers into the sensor payload, for a geochemical survey in the Gulf of Papua, offshore Papua New Guinea in the South Pacific. The Davaria project was a multi-client speculative data shoot, to gather evidence of hydrocarbon seeps, using a glider equipped with two fluorometers (Wetlabs SeaOWL and Turner C3). Then, in 2017, the firm undertook the self-funded Yampi Geochemical Glider Survey, a research and development project in the Browse Basin, off Australia’s northwest coast, to detect gas seeps. This time the survey incorporated the use of methane sensor technology, which have been used on AUVs, but not on underwater gliders before, to give greater detail about the hydrocarbons detected. The Franatech laser methane sensor “high-grades” the information gathered, says Lind. An oxygen sensor was also added. During the 14-day Yampi project, again at 200m water depth, the glider was guided over a well-known seep, near the Cornea oil and gas field. A fluorometer primarily detecting FDOM (fluorescent dissolved organic matter) values was used to detect and help analyse what type of hydrocarbons were present alongside a laser methane sensor. Results from the survey showed a background dissolved methane concentration of 3 to 4 volumes per million (vpm) as well as distinct plumes measuring 30 to 84 vpm. The highest concentration plume was detected at 160 vpm, reflecting existing Geoscience Australia data. During this project, near real-time communication systems and adaptive management of the glider was also tested, using satellite communications when the glider surfaced, enabling pilots in Australia or the U.S. (depending on the time of day) to guide the glider to investigate anomalies in greater detail, and inform the survey plan. Having proved the capabilities of using the glider for seep detection, Blue Ocean has taken the concept a step further this year, by using multiple gliders for a single survey. In a project in May, in the U.S. Gulf of Mexico, four gliders were used together, supported by USBL positioning (for position accuracy) from a manned surface vessel. The gliders were mounted with PAM, CTD sensors, FDOM fluorometer, laser methane and METS methane sensors and a Sonardyne USBL system. The firm is already deploying single gliders fitted with multiple hydrophones, to aid in understanding the directionality of acoustic signals to be ascertained. The next step is to use multiple gliders fitted with hydrophones that are tracked with USBL systems to provide far wider area coverage, with greater accuracy directionality, and capable of providing more accuracy around noise source geo-location. Blue Ocean is looking to trial this system in 2019. For offshore wind construction operations, Blue Ocean is looking at taking take part in a pilot study, to understand piling operations from a remote, dynamic platform and monitor marine mammal activity before during and after these events. The proof-of-concept study is due to take place in Europe with a large-scale offshore wind operator. “Combining PAM and geochemical sensing into single surveys will be a further step in understanding the cost benefits associated with this type of force multiplier,” says Lind. The firm also has a number of studies due to take place in Europe and further afield by the end of this year, involving PAM and fluorometer measurement campaigns.